Edit: Oops! I actually forgot to press the "Commit" button :) Now you can get the new version! Get the new version now! I don't plan on adding any new feature in the near future, unless someone makes a killer suggestion or reports an atrocious bug. Next stop will be working for WordPress 2.7 compatibility, but I won't touch the plugin before a beta or a release candidate for 2.7 is out. Hey, thanks for the credit :) I was actually just looking for the newest version now. I love the "Dale is our Savior" Incoming Link. I should do a check in Opera just to be safe. Thanks again and I really like the icons that were added. One thing you may consider for the next release for WP 2.7 is including icons for the "Flutter / Custom Write Panel / Fresh Post" whatever you want to call it plugin. It's really not that important, just a thought. when I try to configure the settings the changes don't seem to stick (as in, I uncheck the box, but after I click "Save Changes", the options are back to their default settings. Do you know if I need to give permission to anything or what could be the problem? Thanks! 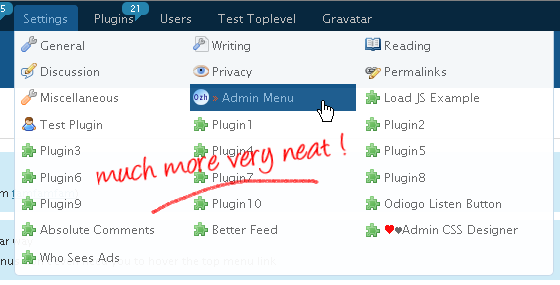 Post: Admin Drop Down Menu, Now With More Safari, Fluency, MU & Columns.